Wow...what a few weeks it has been! The end of the year has finally come and we are enjoying our last week together before we break for Christmas. Thank You - I can't express how incredibly grateful I am for your generous gift! I was blown away and was a sobbing mess by time I had finished the card! Thank you so very much!!!!!!!! Graduation - thank you also to all your support on Friday night. We shared a beautiful mass and then went on to enjoy an amazing Mexican Fiesta! The students are writing letters of thanks to all the Year 5 parents that were involved in making such a memorable event. I will send an email to all Year 5 parents on behalf of the Year 6 parent group expressing our thanks for such a wonderful night. I would just like to say again, thank you to all those parents that were able to come and enjoy our presentations last night. It was wonderful to have so many parents able to make it and to view the amazing work of these students. A big thank you to Alie Smith for organising the food and drinks - we couldn't have done it without you! A massive thank you to Mrs Amie Meyer for all that she has done to make this idea a reality. The success of this event has ensured that this will become an annual event at OLC and it wouldn't have been possible without Mrs Meyer's ideas and dedication to helping the students achieve. Thank you for my lovely gift and kind words, they are both appreciated. I can't believe we are in Week 7 already...the time is flying by! Here are a few notes for you to be aware of. Mackillop Orientation Day - 25th November - Your child will need to travel directly to Mackillop on Wednesday morning. They need to be at school by 8.40am. See the note from Mr Ben Horrocks for further details. Those students that are not attending Mackillop will be expected to attend school on Wednesday. iMovie Night - Please note that this begins at 5pm...not 5.30pm. If for any reason you are unable to get there until later, please don't worry and just come when you can. We will show your child's movie once you have arrived. Please make sure that your child brings their iPad fully charged to play their movie. If you have not returned the envelope and payment for the night, can you please do so as soon as possible. If you have any questions about the catering or food for the night please contact Alie or Bernie directly. Welcome to Week 6...I can't believe how quickly the term is getting away from us! Thank you to those who have returned notes. If you have any to return, can you please send them in by the due date. I have placed copies of all notes sent home last week on the blog. At this stage you can't print them off directly so please see me if you need another copy. 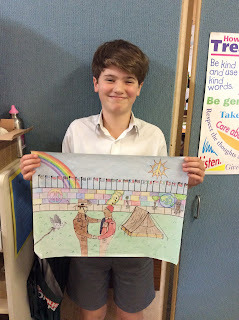 Mackillop Orientation Day - 25th November - I will put on the blog a copy of the letter (in a separate post) that was sent home by Mr Ben Horrocks a few weeks ago for your reference. For those students not attending Mackillop in 2016, please note that your child is welcome to stay home and enjoy a day working on their Year Books. If your child will be coming on the day to OLC on the 25th November, can you please advise me as soon as possible. To celebrate an exceptional year’s work and to farewell the Year 6 students, we will be travelling to Adventure World in Bibra Lake to enjoy a day getting wet and having a great time! The cost for this excursion will be $40 and is payable by the 27th November. If you would like to come with us, please know that you will need to purchase your own ticket. I am still in need of parent helpers, so please let me know if you are able to assist. We will be departing school on Wednesday 2nd December at 6.30am in the morning. I ask that you have your child at school ready to board the bus by 6.20am. We will depart Perth at 3pm with an approximate arrival time back in Dunsborough of 6pm. I will advise Mr Wilkie of our departure time and he can communicate any changes to this time if needed. Students will need to come to school dressed in free dress appropriate for travelling to and from Adventure World. All parents are hereby formally invited to the Year 6 Graduation on Friday 4th December, starting with Mass at the Church at 5:30pm, followed by dinner in the Hall at school. In understanding that all families within our school are different and all are welcome, this year it has been decided that we would like to include the significant adults in your child’s life. For example, a step-parent. Additionally if there are extenuating circumstances that a parent is not able to attend we would like to extend the invitation to include an older sibling. Please see me to discuss this further if you would like. To help the Year 5 parents cater for the evening we need to know how many adults will be accompanying each Year 6 student. Please advise below of any dietary requirements. Could you please complete the “Graduation Dinner” form below and please return it to me by the Friday 27th November 2015. On Thursday 26th November, we would like to invite you to a special viewing of the students “Message to my Future Self” iMovie projects. These are due in on Monday 23d November. This has been a joint project the students have been working on in Library and in class. We will begin with our first session of viewing at 5pm. We will then break for a shared dinner. We will view some more of the iMovie’s before breaking for dessert and then the viewing of the final presentations. We ask that you bring a platter of food to be shared. There is strictly no alcohol to be brought to this event. Bernie Morrison and Alie Smith will be coordinating the food, so if you can please let either of them know what you are able to bring I would be most appreciative. Remembrance Day - we will be celebrating Remembrance Day tomorrow as a school beginning at 11am. We ask that you are seated within the Hall no later than 10.50am so that we can begin promptly. The service will go for approximately for 15-20 minutes and we would love to see you there. Adventure World - A note will be sent home tomorrow seeking permission for your child to attend the End of Year Excursion to Adventure World on Wednesday 2nd December. If you would like to join us as a parent helper we would be most appreciative. Thank you to the 3 parents that have volunteered to supervise a small group, I would like to have another 3 or more parents ideally as this will keep the groups nice and small and easy to manage. Please send me an email or come and see me if you would like to join us! A couple of items to be aware of for the coming weeks! Graduation - this will be held on Friday 4th December beginning with Mass at the Church at 5.30pm. Once Mass has concluded all students and their parents will come to school to attend the amazing Graduation Dinner that the Year 5 parents are kindly organising. All details are a surprise and the Year 5 Graduation Committee has been very busy behind the scenes organising this final send off for the students. Further information will come in the following weeks. Any questions can be directed to Tara Nelson, Genevieve Greaves and Melinda Kartana. Adventure World - On Wednesday 2nd December we will be embarking on an epic adventure to Adventure World! We would love it if as many parents as possible would come with us...either on the bus or in the comfort of your own vehicle! If you would like to attend can you please email me or speak with me directly as soon as possible.